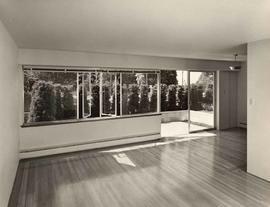 Photograph depicts a balcony in the The Hollies at 6450 West Boulevard.Interior shot of ground floor room with hardwood floors and balcony. Photograph depicts The Hollies at 6450 West Boulevard.High angle shot of entrance to five storey concrete apartment building; trees and tops of houses in background. Photograph depicts the pool and parking lot of the The Hollies at 6450 West Boulevard.High angle shot of three cars parked in front of fenced off "L" shaped pool. Photograph depicts a laundry room in the The Hollies at 6450 West Boulevard.Interior shot of room with linoleum tiles and multiple sets of washer/dryers; bare windows in far wall. 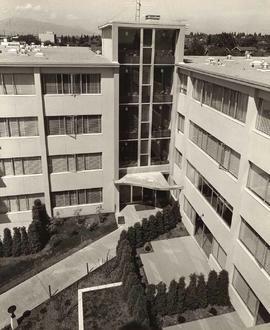 Photograph depicts the lobby of the The Hollies at 6450 West Boulevard.Interior shot lobby carpeted with maple leaf, crown, and lion patterned carpet; mirrored paneling on wall in right of image; staircase in left. Photograph depicts a street view of the The Hollies at 6450 West Boulevard.Distant, side angled shot of three storey, white apartment complex; "MAGEE GROCERY MEAT MARKET" to left of complex. Colour Kodachrome 35mm slide depicts apartment buildings.Note for this slide reads: "Very old apartments along river bank. Some newer ones." Photograph of the interior of Morris and Rose's apartment at "29 Royal Mansions" in 1921.